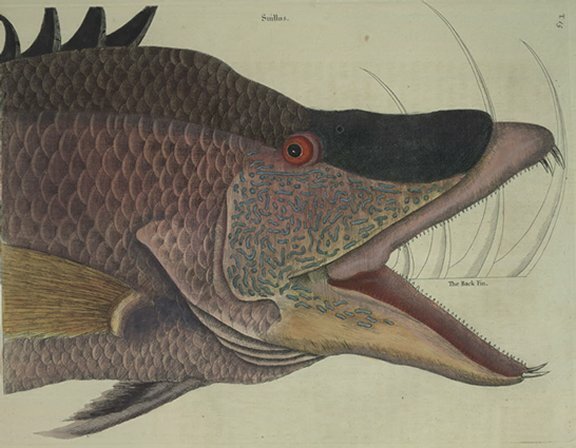 These Fish are taken of several Sizes; but the largest that I have seen was between three and four Feet, as this was: The Iris of the Eye red, the upper Mandible of a fleshy callous Substance and of a reddish purple Colour; which was guarded by a bony Substance as by a Sheild; the upper Part of which to the Eye was black, from under the Eye to the Angle of the Mouth it was purple sprinkled thick over with crooked blue Lines in Form of Wormes; The End of the upper Mandible was armed with four large Teeth, at the End of the under Mandible were also two of the like Size: the Rest of the Teeth were small and in single Rows: The Inside of the Mouth was of a blood-red Colour, the under Jaw yellow. From the Eyes to the Tail, the Back was covered with large purple Scales, those on the Belly lighter with stains of yellow: On the Back was a remarkable black Finn dividing at the Basis and branching into four long pliant Flagelli large at the Basis, and gradually decreasing to their Points, and bending backwards: Behind the Gills were two yellow Finns, and another imperfect one or rather Beard under the Throat. The Tail of this Fish being cut off before I had it, I cannot say of what Form it was.